We live really close to a park and in the park there’s a guy that sells fruit under a rainbow colored umbrella. If you live in LA or ever visited, you’ve probably spotted a fruit vendor under a rainbow umbrella. They are about as ubiquitous (and delicious) as taco trucks. One of my favorite things to get from the street fruit vendors is watermelon covered in chili, salt, and lime. Since it’s officially watermelon season, I thought it would be fun to share a fun and oh-so-delicous recipe video that’s inspired by the LA fruit stands. Watch it below and keep reading for the full recipe. Use a sharp knife to cut a watermelon into 1″ thick rounds. Then cut each round into 4-6 pie-shaped pieces. Use a pairing knife to cut a small hole in the middle of the rind of each watermelon slice. Insert a wooden popsicle stick into each hole. 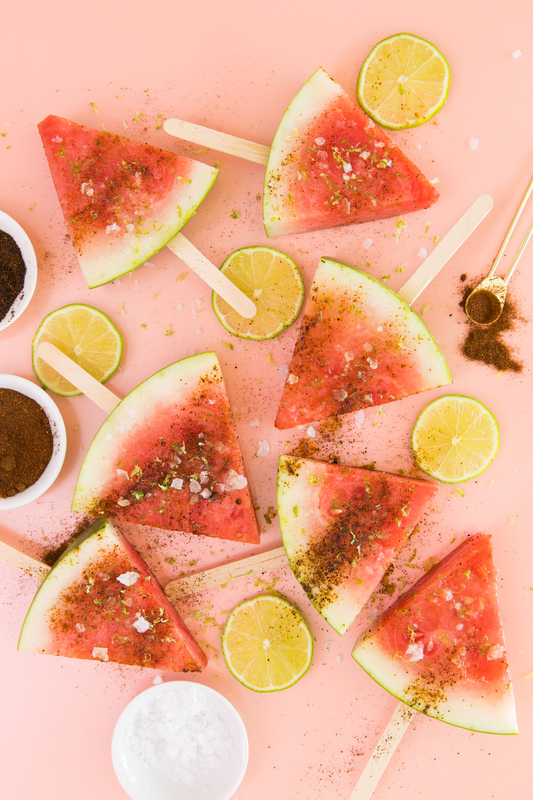 Just before serving, sprinkle each watermelon slice with chili powder, smoked paprika and sea salt. Add a touch of cayenne powder if you like heat. Top with fresh lime juice and lime zest and enjoy! Sticking watermelon slices onto wooden popsicle sticks is now my favorite way to serve watermelon. It looks cute on a serving tray and easy to eat. I just always make sure to save the watermelon rinds for my horse, they are his favorite treat! This recipe isn’t exact on purpose. Just add as much (or as little) of each spice as you like and you can’t go wrong. If you love sweet and salty combinations, go heavier on the sea salt. And if you love all things spicy, add some cayenne powder! This look really appetizing. thanks for sharing this!